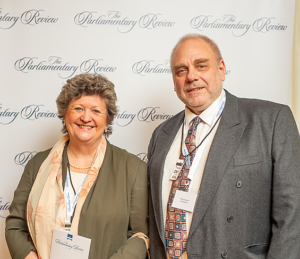 TimeFinders is proud and excited that our innovative services have been selected to highlight best practice in the Parliamentary Review of Care: Support, Wellbeing and Awareness. This is an important validation for TimeFinders, providing practical help and emotional support to older people in changing circumstances. We have developed a new type of professional service which many people don’t realize is available and yet which bridges the yawning divide between the legal and financial professions and the care sectors. From the outset, we have established the highest standards of integrity and transparency where no regulation exists. As our population grows older, many more people are ageing alone1 without close family members to support them. Our Advocacy Services ensures that our clients’ voices are heard, and their best interests protected whether they have capacity or not. 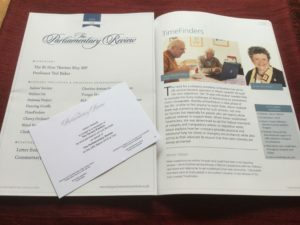 The Directors of TimeFinders, Alison and Philip Hesketh attended a Gala, hosted by Lords Blunkett and Pickles, to celebrate the publication of The Parliamentary Review of Care will be held on Thursday 28th March 2019 at The Houses of Parliament. 1 ONS Cohort Fertility 2010: one in five women born in the mid-1960s do not have children. Institute of Policy Research Generation Strain Report estimates by 2030 there will two million people in UK aged over 65 with adult children. No similar statistics are collected for men.